There are places within just a few hours of Phoenix where you can satisfy that urge to ski. These make great day trips from the Phoenix and Tucson areas for family outings or weekend ski getaways with your friends. If you don't want to spend the money on plane tickets to Colorado or Vermont, just get in your car and head to the Arizona ski slopes. Arizona Snowbowl is two to three hours from Phoenix, depending on where in Phoenix you start your trip. Arizona Snowbowl, when in full operation, has five ski lifts with the highest being 11,500 feet. The longest run is two miles. There are 40 runs/trails at Arizona Snowbowl on 777 skiable acres. The breakdown for skiers is as follows: Beginner: 37%, Intermediate: 42%, Advanced: 21%. The longest is two miles. In addition to the five aerial ski lifts, there are two surface conveyors. The average snowfall at Snowbowl is 260 inches per year. The season starts in mid-November. Arizona Snowbowl is seven miles north of Flagstaff on Highway 180, 7 miles to ski slopes on Snowbowl Road. There are also many motels in the Flagstaff area where people stay when they are enjoying a weekend or longer trip to Arizona Snowbowl. Check guest reviews and prices for Flagstaff, Arizona hotels on TripAdvisor. Arizona Nordic Village will appeal to those who enjoy cross-country skiing and snowshoeing. Arizona Nordic Village is located in the Coconino National Forest, just seven miles north of Snowbowl Road on Highway 180. You can purchase day passes or season passes. Instruction and equipment rental are also available at the Center. Previously known as Flagstaff Nordic Center, the destination has been reinvented to offer not only cross-country skiing and snowshoeing, but also glamping in yurts and cabins, bike and foot races, special events, corporate meetings, family reunions, and weddings. 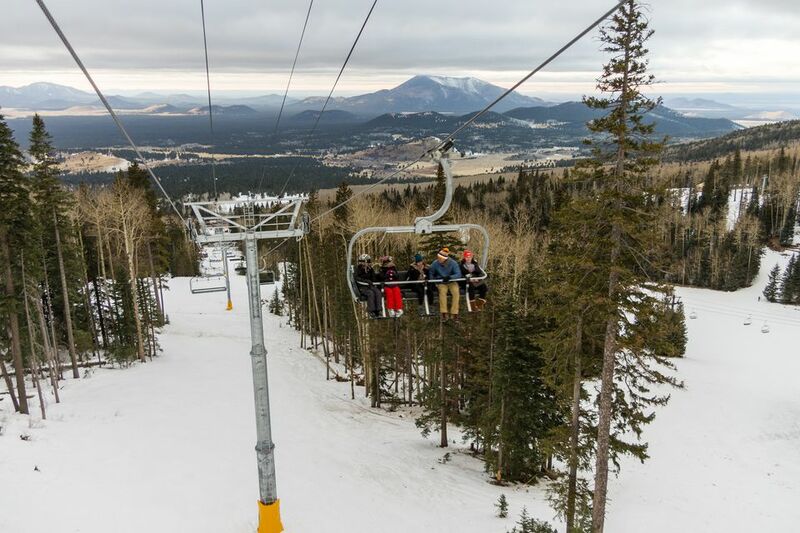 Although Arizona Snowbowl may be the best-known ski area in Arizona because of its proximity to Flagstaff and Northern Arizona University, Sunrise Park is the largest with 65 runs. It is located in McNary in the Arizona White Mountains. Sunrise is just over 200 miles from Phoenix. Sunrise Park Resort is owned and operated by the White Mountain Apache Tribe. Sunrise operates eight ski lifts. There are also over 13 miles of trails for cross-country skiing and there are special programs available for children so they can enjoy their time in the snow. Lodging is available at the Sunrise Park Lodge. To check the weather, use the town of Greer, Arizona for your weather search. You might be surprised to know that you can ski in Tucson, Arizona! Mount Lemmon is in the Catalina Mountains and is the southernmost ski resort in the United States. They have one ski lift and eighteen ski trails. To get to Mount Lemmon Ski Valley, take the Catalina Highway off Tanque Verde Road in Tucson. Drive 4.2 miles to the Forest boundary and continue 26 miles to the Ski Valley turnoff. Turn right and drive one mile to the ski area. Instruction is available. There's also a snack bar and a restaurant at the ski resort. Check guest reviews and prices for Tucson, Arizona hotels on TripAdvisor. Try to stay at one on the northeast part of the town to be close to Mount Lemmon. The Elk Ridge Ski Area used to be known as the Williams Ski Area. It considered a family ski area, oriented toward beginners and intermediate skiers. There are two lifts and seven trails. There is also a day lodge and a snack bar. Williams is about 30 miles west of Flagstaff on I-40. From Williams, take 4th Street about 1.5 miles from the edge of town south to the ski area sign. You can get a snow report for the Williams Ski Area by calling (928) 234-6587. You Can Ski and Snowboard in Arizona!